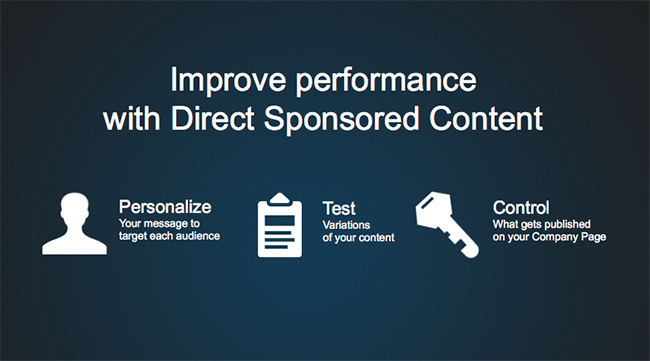 LinkedIn announced today the launch of Direct Sponsored Content, an expansion of its year-old Sponsored Content ad product. The new feature is currently only available as a pilot for select partners, including Comcast and NewsCred. LinkedIn’s Sponsored Updates product launched a year ago, providing advertisers the ability to run native-style ads in the form of articles, blogs or videos on a user’s feed. The ads encourage users to follow companies or like/comment/share content. The new “Direct” feature allows companies to test posts that won’t clog their company page, similar to Facebook’s dark posts offering. The launch of Direct Sponsored Content comes just after LinkedIn’s acquisition of Bizo, a B2B advertising platform, which the company announced on Tuesday.